Printed Accent Jute Rugs by Earth Rugs | P.C. Fallon Co. 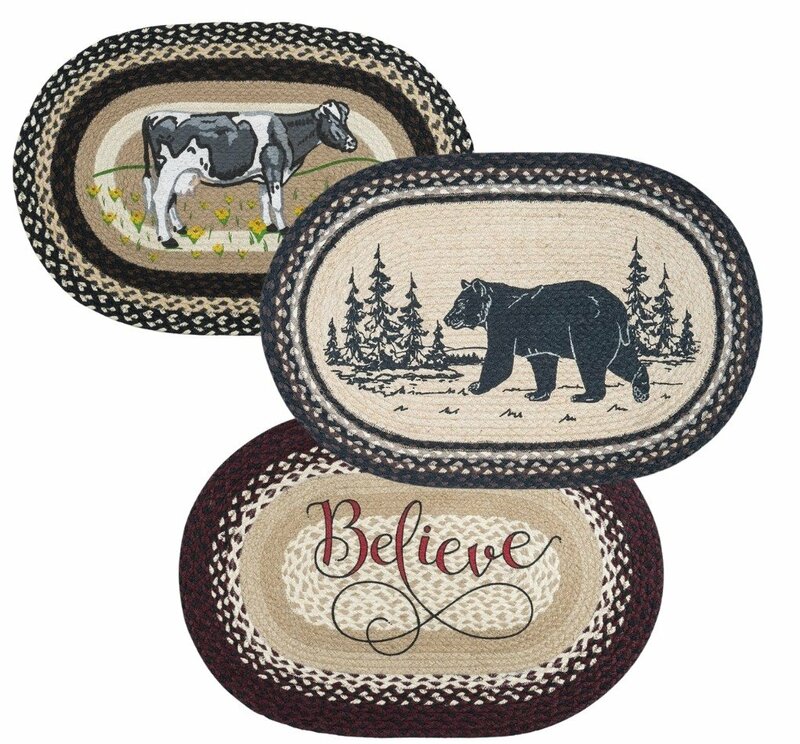 Choose from hundreds of durable, natural braided jute rugs with printed images including stars, bears, mermaids, birds, dogs, cats, flowers, boots, horses, owls, fish, flags, moose, anchors, seashells and other nautical and coastal themes. Cardinal Braided and Printed Oval Rug 20"x30"
Pinecone / Welcome Braided and Printed Oval Rug 20"x30"
Buffalo Braided and Printed Oval Rug 20"x30"
Cranberries Braided and Printed Round Rug 27"x27"
Gingerbread Men Braided and Printed Oval Rug 20"x30"
Green Stars Braided and Printed Oval Rug 20"x30"
No Place Like Home Braided and Printed Oval Rug 20"x30"
Patriotic Crow Braided and Printed Oval Rug 20"x30"
Raccoon Welcome Braided and Printed Oval Rug 20"x30"
Santa Braided and Printed Oval Rug 20"x30"
When properly cared for, a jute rug will last for many years. Just like other fine rugs, they can be cleaned when necessary with mild soap. Vacuum normally being sure to first trim any loose fibers that might get caught in the vacuum beaters. Do not machine wash.